Feast your eyes. And your mouth. 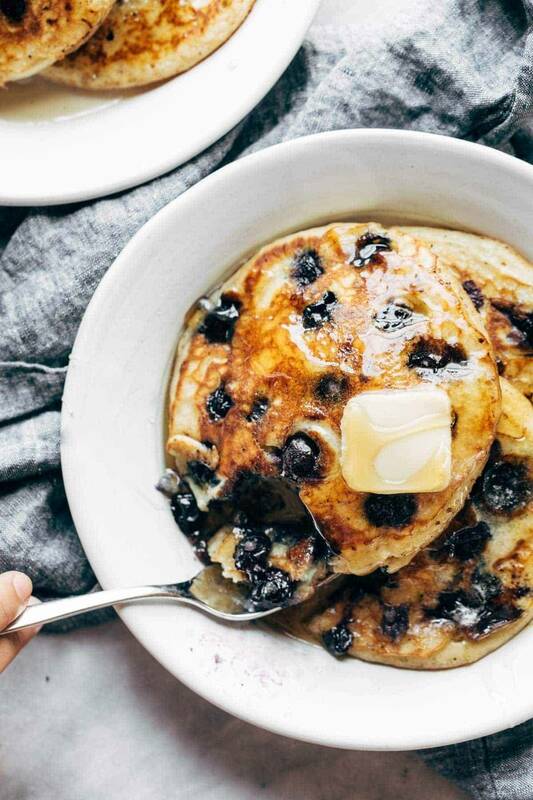 Today is dedicated to super basic, super fluffy, bursty blueberry pancakes, and here’s why. It’s blueberry season, but not for much longer! Let’s MOVE, people! It’s back to school season, which means lazy weekend mornings are every kind of special right now. 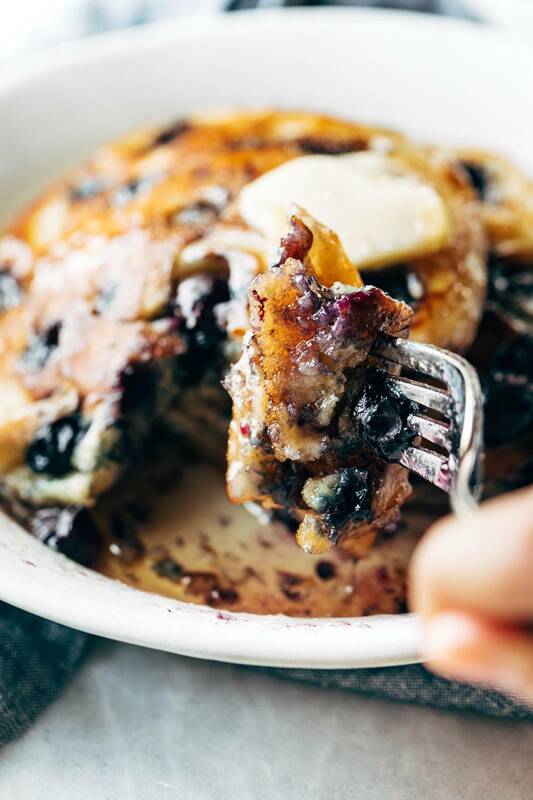 You can fancify pancakes all you want, but can you really ever deny a butter-soaked pancake laced with maple syrup and dripping with hot blueberry juices? If you can, you are probably not human. You guys are not going to believe this, especially if you’ve watched the Bjork In The Kitchen segments on our Instagram stories, but BJORK was the person who first made these pancakes for me. He went through a phase (it was definitely a phase as it seems to be done for now) where he would make pancakes for me on Saturdays, and in his very professional pancake research and extensive testing – LOLS – he came across this unfancy recipe on AllRecipes for a really good batch of standard, fluffy, buttermilky pancakes. And do you know what? They are so good that they have permanently become our standard pancake recipe. These are THICK, so if you don’t like thick pancakes, we might be in a little fight right now. They are just the right amount of sweet and melt-in-your-mouth delicious. The first few times I ate them, I ate them completely PLAIN. As in, no butter, no syrup, no nothing. DO YOU EVEN HEAR WHAT I AM SAYING? They were so good that I was eating. them. plain. So we were already making these a lot. Sans blueberries, sans syrup. Just plain old LIFE CHANGING pancakes. But now that we have a Costco membership and are trying to fill our faces with all the nice organic fruits that are filling up our fridge, I have been unable to keep the fistfuls of blueberries out of these pancakes this summer. Bjork’s AllRecipes pancake recipe base (modified slightly! you know how I am) plus a little assortment of fresh blueberries tucked in there for good measure? This is the stuff of late August Saturday morning dreams. This recipe serves 2-3 people, I’d say, which is kind of perfect for us because we don’t end up with 800 million pancakes leftover. But keep in mind that that’s coming from a pretty pancake-hoggy person – we make them big and we each eat multiples. If you are planning to more REASONABLE about your pancake life, then you could probably feed closer to 4 people. Fluffy pancake goodness. Blueberry pockets. Butter. Syrup. Fork. Face. Go. 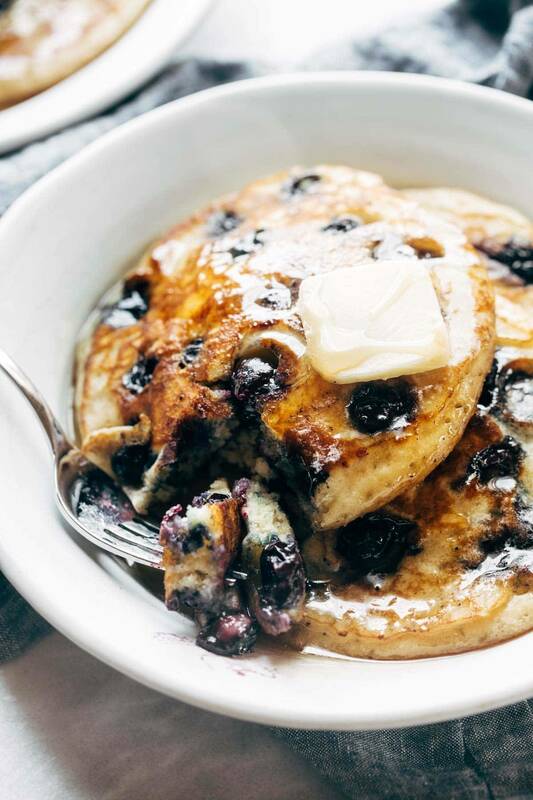 Super basic, thick and fluffy blueberry pancakes – the best I’ve ever made! Melt in your mouth, golden brown, and bursting with blueberries. Mix the milk and vinegar and let it sit for a minute or two. 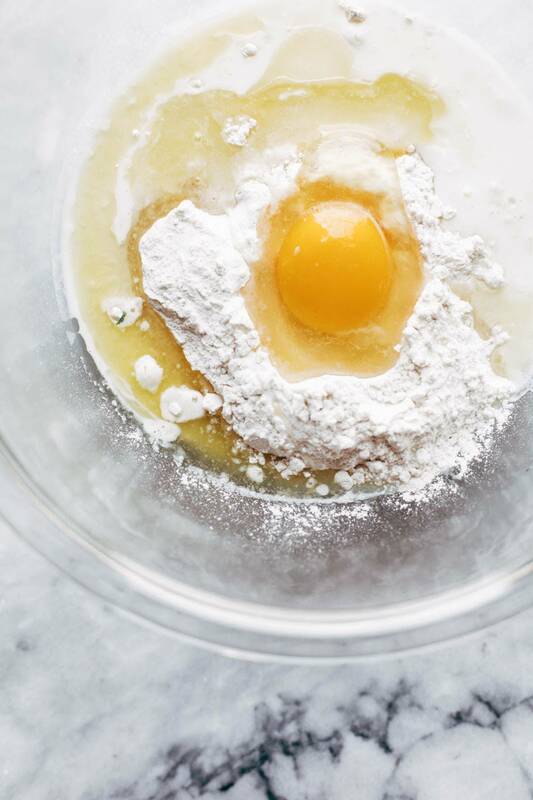 Mix in the egg, milk, and melted butter. Heat a griddle or skillet over medium heat. Melt a little smear of butter in the pan (essential for giving them a reeeeally yummy golden brown crust). Pour about 1/3 cup of batter into the hot skillet and spread it flat-like (it will be pretty thick). Arrange a few blueberries on top. Cook until you see little bubbles on top and the edges starting to firm up. Flip and cook for another 1-2 minutes until the pancakes are cooked through. Serve with butter and maple syrup. But honestly, sometimes I just like to eat these plain. YUM, YUM, YUM. For thick pancakes, use 3/4 cup milk as directed. For lighter, slightly less fluffy pancakes, use 1 cup milk. 3 Ingredient Vegan QuesoAugust Coffee Date: Baby Edition! Oh man, my 3-year-old and I made these for the family for a surprise breakfast- some with blueberries, some with chocolate chips, and some plain – and let me tell you, we all agreed they were the best pancakes we’d ever had!! Loved that it was so simple that I – a very pregnant lady on modified bedrest – could do it with my tiny sous chef. We can’t wait to try it with other fruits and toppings. This is our new go-to weekend breakfast! This recipe is amazing!!! I didn’t have an egg and my pancakes were still awesome. No more bisquick for me!! Thanks!!! Okay……These pancakes were amazing! I have been searching for the perfect pancake recipe that all would enjoy. These were the right amount of fluffy for everyone, and the flavor was outstanding! Plus the recipe makes about 4 decent sized pancakes which was perfect for my fam! Thank you Pinch of Yum!!!!! I made these pancakes two times this weekend and they were fantastic! The whole family loved them. I also wanted to mention that I have made the Zucchini Lemon Poppy seed muffins twice – also a huge hit with everyone. And finally my 13 year old loves the Spicy Shrimp Veracruz. I have made that at least 5 times now. He loves taking it in his thermos for school lunch. Thanks Lindsay! Just made these this morning and my husband, three year old and I gobbled them up- SO GOOD!!! It is definitely think and fluffy. But…. But has a bit sour vinegar taste…. 2tbs too much? This sounds amazing. Definitely different in many aspects. I’m going to try it as is and try it different fruits. These are AMAZING! I found your website a few months ago from your soft chocolate chip cookies (which is now my go to cookie recipe!) And this is the fourth meal I’ve made from your site and each has been met with praise from my very picky family. Although I did make some with strawberries for my extra picky sister! OMG! These are the exact pancakes I have been making for years! I do suggest using real buttermilk instead of the milk/vinegar combo. They are even more amazing if you can imagine it. I also like to double the recipe and freeze the extras. They reheat well in the toaster. Last xmas I mixed up the dry ingredients and gave them along with the instructions to my sister-in-law and she was so excited. She said she loves my pancakes! Also, check the allrecipes site for maple butter. Switch out the white sugar for brown(obviously goes better with maple). This stuff is amazing! You don’t need syrup at all if you put this on your pancakes. It’s great on muffins, scones, baked oatmeal, etc. Enjoy! These are without a doubt the BEST pancakes I’ve ever had! So fluffy, so tasty… yum. 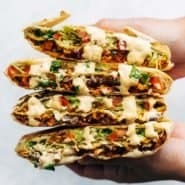 We’ve already made them twice and I can tell they will be a staple in our family’s weekend brunch! I had been looking for a good pancake recipe to make with my kids on weekends and all the ones I made came up short. This recipe is so easy and was amazing. I made some with blueberries and some with chocolate to please everyone. They were fluffy and rich and my 7yo said they were epic/best ever. I agree. I tried these and they were amazing. I used raspberries as well it came out beautifully. If you have leftover and you want to reheat I have a great article written by Jennifer Kessler (https://shelovesbest.com/best-way-to-reheat-biscuits/). It works great on pancakes as well. These were amazing! Saving this recipe. These were the best pancakes I’ve ever made…hands down! I made them with blueberries for myself and my husband and I didn’t even need syrup! My granddaughters wanted them without blueberries and they said they were delicious. They each ate 3 big ones! Thanks for the great recipe. Awesome recipe! I modified a bit by substituting 1/2 cup almond flower and used 1/2 cup all purpose flour. I added coconut flakes and blueberries right into the batter. I used a little less sugar than recommended. These are by far the best pancakes I have had! This is a great recipe, I only made with organic blueberries from Costco. I did make two changes, I added 1.5 t of baking powder instead of 1 and I added two teaspoons of vanilla. SOO good. I had to use frozen blueberries because it is winter, but they turned out super awesome. Glad you enjoyed them, Amanda! Tried these instead of our regular sour cream pancakes that our boys (now men) always want and have used for years. Well these for sure are some great pancakes and will definitely be used again and again. What can I say after making this recipe, I will never ever for ever buy box pancake mix again. These are the best blueberry pancakes. It also works if you don’t have blueberries. Only change was 2 tsp if pure vanilla. I’m curious what the vinegar in the recipe does? 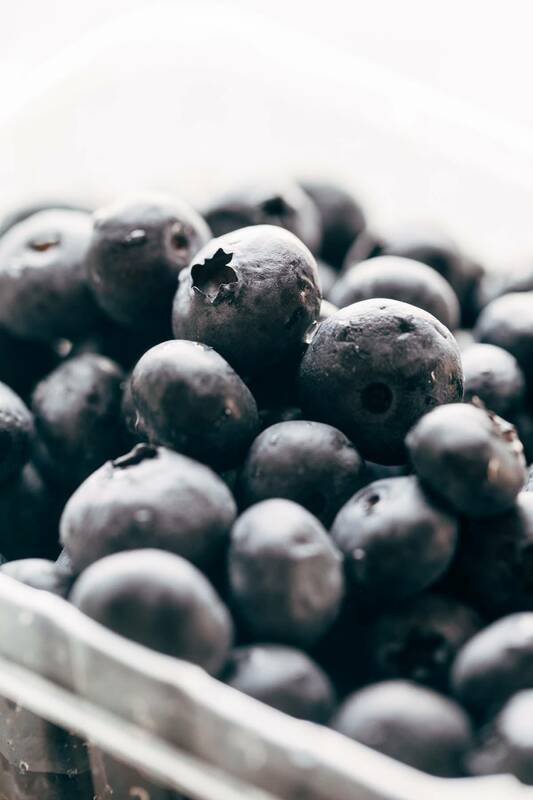 Love fruit in pancakes…blueberries a classic! I’ll try thrm soon!